2016 re-issue is on Bicycle Music. 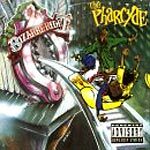 This classic album was heralded as Pharcyde's best, released in the midst of the gangsta rap era and broke ground as establishing focus on the LA underground among the likes of Freestyle Fellowship and Nonce. Freestyle inspired rhymes, and quirky subject matter helped make this an album considered essential among hip hop listeners.